This illustration from the Akbarnama (Book of Akbar) is the right side of a double-page composition designed by Basawan, one of the greatest artists at the Mughal court, with details painted by Tara the Elder. The left side is Museum no. IS.2:62-1896. 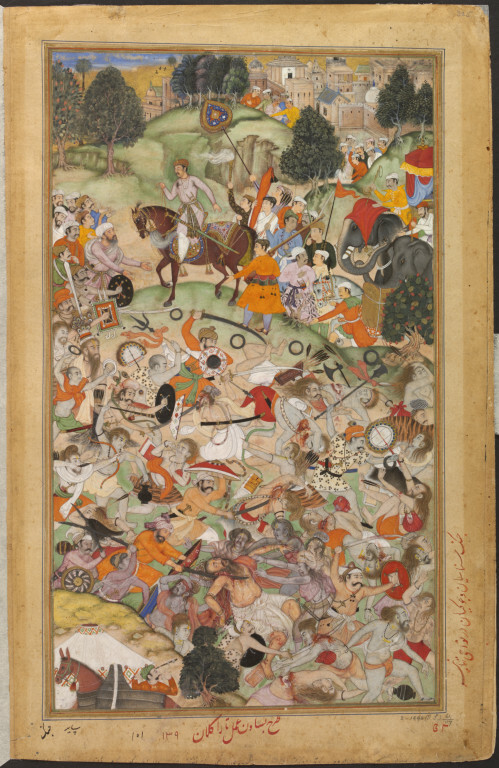 Together they depict a battle between sannyasis (Hindu devotees) at Thanesar in north-west India, watched by the Mughal emperor Akbar (r.1556–1605) on horseback, accompanied by his entourage. Painting, in opaque watercolour and gold on paper, right side of double picture, left side being IS.2:62-1896. This image depicts Emperor Akbar watching a battle between two bands of sanyasis (Hindu devotees) at Thanesar. This foreground of the painting is taken up by the bloody fighting which is portrayed in gruesome detail including a severed body at the front. 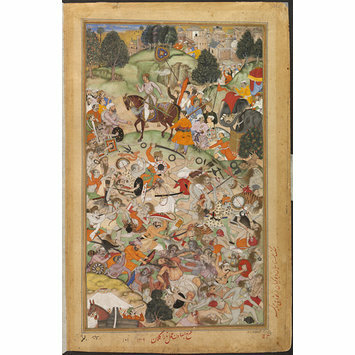 The emperor on horseback is watching the battle scene accompanied by his entourage. p. 77. fig. no. 9 and pp. 172-5. Outline composed by Basawan painted by Tara the Elder.